Jang-ryang (Kim Il-woo) cried tears of joy at the appearance of Yoo-bang (Lee Beom-soo) and Beon-kwe (Yoon Yong-hyun). The latest episode of SBS TV "Salaryman", aired on January 24th, showed Jang-ryang and Hang-woo (Jung Gyu-woon) competing for a team project. Jin Si-hwang (Lee Duk-hwa) offered the position of vice-president of the company to whoever won the team project, regardless of status. However, Hang-woo sought the greed of getting rid of Jang-ryang and decided that whoever lost this project should quit and leave the company. He gave his teammates the rights to choose the team leader. They didn't hesitate and chose his side. However, Yoo-bang and Beon-kwe stood firm by Jang-ryang's side. He was touched and cried. Meanwhile, Yeo-chi (Jung Ryeo-won) stood by Hang-woo's side on Mo Ga-bi's (Kim Seo-hyung) suggestion. 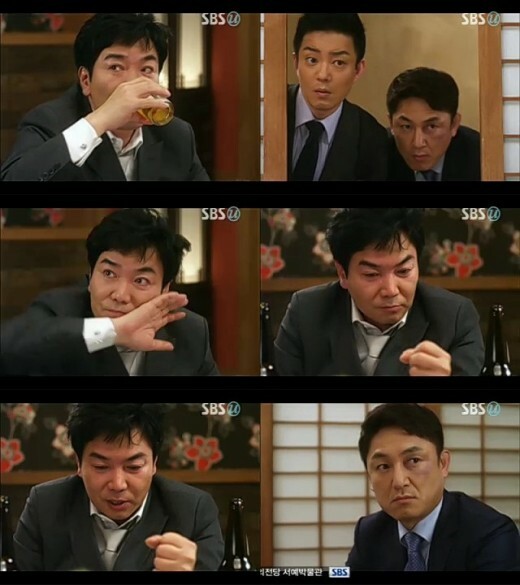 "[Spoiler] "Salaryman" Kim Il-woo cries tears of joy for Lee Beom-soo and Yoon Yong-hyun"
[Spoiler] "Lights and Shadow" Lee Pil-mo tells Ahn Jae-wook "I love Nam Sang-mi"